Leave it to a pair of Brazilian architects to use reinforced concrete to reinvent small-scale urbanism. While North American designers turn to plywood and recycled palettes to create curbside seating, architects Fernando Falcón and Rodrigo Cerviño of the São Paulo–based practice TACOA Arquitetos shopped for rebar. Entitled Jardineira, Falcón and Cerviño’s installation is a cantilevered concrete planter and bench located on the busy Insurgentes Avenue in Mexico City. The work sits outside the architecture gallery LIGA, Space for Architecture on one of the city’s major thoroughfares. 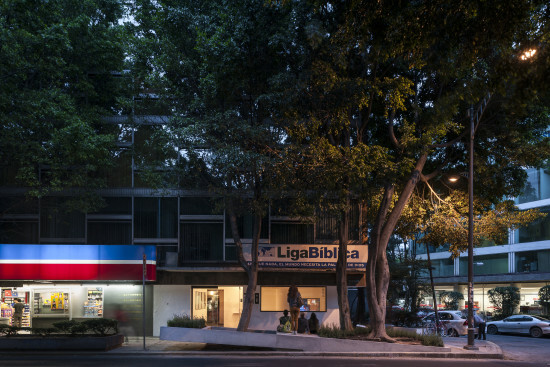 Founded in 2011, the gallery focuses on primarily on Latin American practices and Jardineira is the first time that an exhibition has left the 172-square-foot venue and directly addressed the street condition. The concrete installation mimics the existing street furniture, but with one exception: it tilts, seemingly dislodging itself from the sidewalk. “I knew it would be good when they wanted to bring in a structural engineer,” said architect Wonne Ickx, co-founder of LIGA and the architecture firm Productora. An emerging firm, TACOA believes that any work of architecture should serve as a pretext for interacting directly with the city. As their installation illustrates, they do this without abandoning disciplinary rigor or a formal language. The pair ground their work in the teachings of the Paulista School, the mid-century group of Brazilian architects that included Pritzker Prize–winner Paulo Mendes da Rocha and João Batista Vilanova Artigas. Designs from both architects are included in the current MoMA exhibition Latin America in Construction: Architecture 1955–1980. While most would associate Brazilian architecture with the swoops of Oscar Niemeyer, the Paulista School embraced the grittier side of architecture with chunky, exposed concrete buildings. Similarly, Falcón and Cerviño find inspiration in the frictions and imperfections of urban life. Jardineira is on view at LIGA through August. 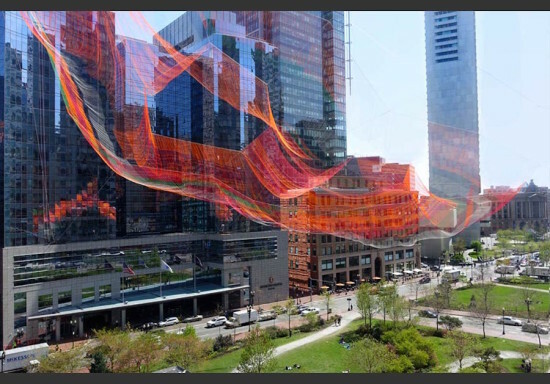 A multicolored aerial sculpture lords over the Rose Kennedy Greenway in Boston in spiderweb fashion, casting rippling shadows over the pedestrian-friendly highway topper. While it appears to be as delicate as lace, the contraption, comprising over 100 miles of knotted fibers, is 15 times stronger than steel and weighs in excess of one ton. Artist Janet Echelman hand-spliced and knotted the colored rope into half a million nodes, with the entire structure suspended from three adjacent skyscrapers like a hammock 600 feet above the traffic below. Mystically titled As If It Were Already Here, the mid-air spectacle symbolizes the history of its location. The three voids in the sculpture are a nod to the three hills of Boston, which earned the city its “Tri Mountain” appellation before the mountains were razed in the 18th century to extend the land into the harbor. “It is a physical manifestation of interconnectedness and strength through resiliency,” Echelman wrote on her website. Meanwhile, the bands of color in the netting refer to the former six-lane highway that once dichotomized downtown and the waterfront. In 2008, it was converted into the Rose Kennedy Greenway. By day, the sculpture blends almost entirely with the sky, so that the striated colors appear as a misty, mirage-like sheen that shifts according to wind speed changes detected by sensors that register fiber movement and tension. This data also determines the color of the light projected onto the sculpture, so that when any one element moves, the entire sculpture is affected. By night, the sculpture illuminates in various colors. The intricate feat of engineering was first modeled on a software program developed in connection with Studio Echelman and Autodesk, featuring a custom plug-in for exploring net densities, shape, and scale while simulating gravity and wind. The sculpture will be on view from May through October 2015 as part of the Greenway Conservancy's Public Art Program. Streaming from the ceiling like colored rain, Daniel Steegmann Mangrané’s steel curtain installation is far less delicate than it appears. Up close, the completely see-through curtain of steel mesh looks like raindrops stitched together, whose straight-down free-fall is punctuated by geometric and and insect-like laser cutouts framed in powder-coated steel. 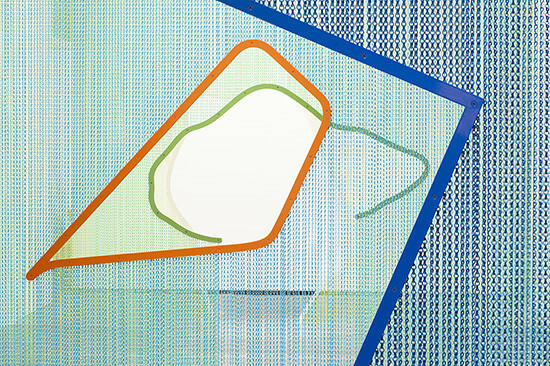 The cutouts are painted in a contrasting look-at-me neon shades against the primary colors of the mesh, and those reaching down to the floor are sufficiently large for the viewer to pass silently through. In other instances, the cutouts are positioned at eye level, in which case the viewer must walk straight through the mesh, a metallic clinking sound announcing his or her entrance. Half industrial and half handmade, Mangrané’s installation dithers at the intersection of immateriality and corporeality. Such curtains are frequently found in butcher shops and home entrances. Currently on view through May 24 at the New Museum’s 2015 Triennial: Surround Audience in Manhattan, Mangrané’s curtains operate both as independent sculptures and elements of a larger installation. The installation has migrated to and from various prominent exhibitions, recently generating buzz at the Frieze Art Fair New York 2014 and the Nouveau Musée National de Monaco. Spanish interiors company Kriska Décor produced the mesh curtains for the Spanish born, Brazil-based artist. Change is underway at Chicago's Museum of Contemporary Art. At a press conference Friday MCA officials revealed that the institution is working on a new image, new programming and even a new master plan for the museum's space led by Los Angeles–based design firm Johnston Marklee. The announcement was timed to coincide with the last push of a major fundraising campaign. The museum has quietly raised $60 million in recent years, nearing a “vision campaign” goal of $64 million. Today they revealed their latest donation: $10 million from Kenneth Griffin, an MCA trustee who is also the richest man in Illinois. MCA's fourth floor galleries will now bear his name. “We've been thinking about what a 21st Century museum looks like,” said Madeleine Grynsztejn, MCA's director. Citing figures from the National Endowment for the Arts, Grynsztejn said the museum needs to become more “responsive” to the community—“a civic institution of local necessity and international distinction.” Part of that mission includes converting the cafe space into an “engagement zone” for public events, performances and education. Museum goers looking for a snack will have to find it on the first floor, where a new restaurant will front onto Pearson Street. Those and other changes to the 1996, Josef Paul Kleihues–designed building's programming are part of a new masterplan currently in development at the offices of architects Sharon Johnston and Mark Lee. Dutch designers Armand Mevis and Linda Van Deursen of the firm Mevis & Van Deursen also designed a new logo for the museum—part of a larger campaign to rebrand the museum and reengage with a public tempted to seek out art online or otherwise outside the Streeterville museum's walls. MCA has had some success reinvigorating popular conversation about contemporary art with its David Bowie Is exhibition, which recently wrapped up its run at the museum after drawing nearly 200,000 visitors—an MCA record, according to Grynsztejn. “The Bowie show challenged the MCA to raise our game,” she said. That could include expanding hours or more drastically reconsidering the museum's model, Grynsztejn wondered aloud Friday. But it will definitely include more shows for young artists on the cusp of a breakout, said curator Michael Darling, as well as more interactive exhibitions. Darling pointed to an upcoming residency by the Grammy-winning chamber group Eighth Blackbird, which he said would include unannounced and improvised performances throughout the museum, with the intent to connect the public with contemporary music and the process of creating it. Collaborative installation translates sound into motion. When Brooklyn-based design and fabrication studio The Principals began collaborating with musician Dev Hynes on Ancient Chaos, a sound reactive installation commissioned by speaker company Sonos, they had only a vague sense of the project's goals. "The general concept was that we wanted to create an architecture that was fluid like sound, and to create sounds that were architectural," said co-founder Seskunas. "We wanted to have an installation that was both of those things but neither—a very ephemeral, nebulous concept of what sound and architecture could be." Then Seskunas went surfing with a friend, and, in between sets, found himself mesmerized by the ever-changing play of sunlight on the ocean. "Could we create an architecture that had this quality to it?" he questioned. Constructed from 6,000 individual pieces of Mylar set in motion by high-powered stepper motors, Ancient Chaos answers Seskunas' question in the affirmative. The installation, which debuted at New York's Neuehouse last year, is a moving meditation on the relationship between sound and space. Over the course of a two-month ideas exchange with Hynes, who composed an original piece for the installation and performed at its opening, The Principals started by sketching and creating photo collages of bodies of water. They then revisited a mechanical system developed for an earlier project, which involved assembling flat pieces of paper into an accordion panel. When suspended and set in motion, the panel created gradient waves and apertures that closed and opened. But while the primary focus of the earlier installation had been the apertures, for Ancient Chaos "we wanted to focus on the surface quality [of the form], and to highlight different two-dimensional curvatures," said Seskunas. They also swapped out the paper for silver-coated Mylar, which—while difficult to obtain in the quantities and thickness the designers required—offered an intriguing combination of reflectiveness and stiffness. Site constraints (Neuehouse is a private club, to which the designers had only limited access) required The Principals to design and build a free-standing aluminum support system for the 8-foot by 36-foot canopy. Working in Rhino and Autodesk Inventor, "we created a pretty intricate structure," said Seskunas. "We had a complicated digital model for each part." They unitized the Mylar form into 4-foot by 8-foot panels, each of which was assembled from thousands of die-cut Mylar pieces and transparent Popco fasteners. To translate Hynes' music into motion, The Principals attached a series of stepper motors to the top of the installation. The motors are in turn connected to a frequency analyzer that splits the sound into seven frequencies. When a particular frequency occurs, a custom program directs motors on the corresponding area of the canopy to oscillate. A boom mic picks up ambient sound, which is likewise split and transformed into directions for the stepper motors. "You see the speed and oscillations" across the installation, said Seskunas. "It pulls apart the threads of the sound, and manifests them in movement." One of the most striking features of the installation (which has since been relocated to Sonos' permanent studio in Los Angeles) is also one of the less choreographed. Static lights above the moving canopy shine down through the transparent acrylic fasteners to create an effect not unlike that Seskunas witnessed from his surfboard. "It's beautiful how they transmit light," he said of the fasteners. "We were really excited about that." Installation inverts conventional relationship between architectural models and images. Each year, a group of Pratt Institute graduate students is challenged with pushing the boundaries of exhibition design as they curate the student work from the previous year. "The basic brief is for it not to be a show where it's work on white walls, but that there's an installation component," said Softlab's Michael Szivos, who co-taught the 2014 exhibition course with Nitzan Bartov. The spring show coincides with the publication of Process, a catalog of student projects. "The book shows it in that more normative condition, year by year," said Szivos. "The installation works in tandem with that. The hope is that the students come up with something different." This year Szivos' students passed the test with flying colors, constructing a floating display out of Mylar, medium-density fiberboard, cardboard, and Tyvek that upends the conventional relationship between architectural models and two-dimensional images. Most of the students' initial concepts had to do with producing a cloud-like space, a display surface that would have an interior as well as an exterior. 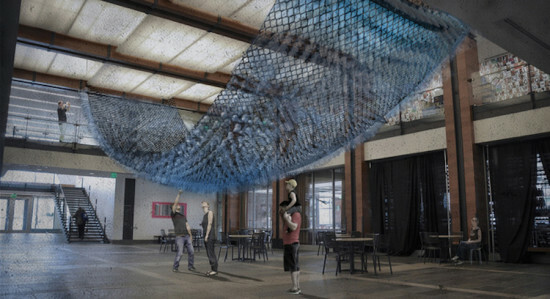 They eventually translated the cloud into a Mylar net that acts as both surface and structure. Architectural models, typically relegated to podiums on the fringes of an exhibition, are given pride of place on integrated MDF platforms perforated with attenuated cardboard tubes. The visual work, in turn, is placed on the ground, positioned as if it is being projected from the suspended tubes. Conventionally, said Szivos, "the hard layer is usually resting on the ground; then you have the visual layer above it. Here, the hard surface is flipped upside down and floating." Visitors access the models by ducking underneath the Mylar cloud, then standing within one of several holes in the bottom surface. "The goal was that the models would actually be seen at eye level," said Szivos. "In this case, it's almost as if it's a city of models. Each zone is a place where the models can be viewed on real architectural terms." A second goal was surprise, which the students achieved by concealing the models behind diamond-shaped Tyvek panels attached to exterior of the net. "You don't know what's inside until you engage," said Szivos. The students engineered the cloud structure using Rhino and Kangaroo. In just two months—the exhibition is timed for Pratt's spring open house—the students finalized the design and decided how to fabricate it. The bulk of the cloud is made of laser-cut Mylar panels fastened together with grommets. Loops at the bottom of the panels secure platforms made of CNC-cut MDF scattered on a sea of sawed-off cardboard tubes, while the Tyvek panels (also laser-cut) are held in place with fashion snaps. The entire installation hangs from a tube frame of galvanized pipe clamped to the gallery's ceiling beams. Time constraints led to a few shortcuts. The students initially intended to develop a projection component, but in the end simply printed most of the two-dimensional images and placed them on the floor. They had also hoped to cover the entire Mylar net in Tyvek, but eventually limited themselves to the lowest rows only. 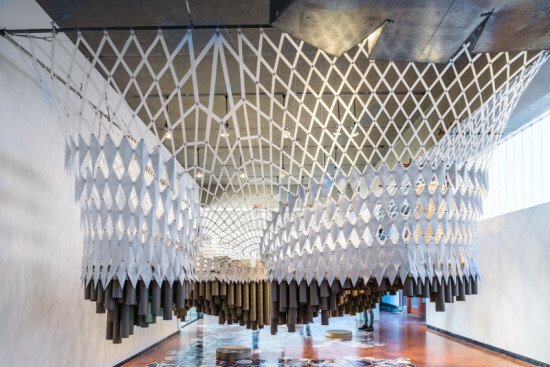 Nevertheless, the project effectively demonstrates the architectural potential of surface-as-structure—in this case, a net weighing under 20 pounds that suspends over 500 pounds of weight. "The surface is a structural skin," said Szivos. "What's nice is that even though it's only attached on the outside, there are still interior spaces." 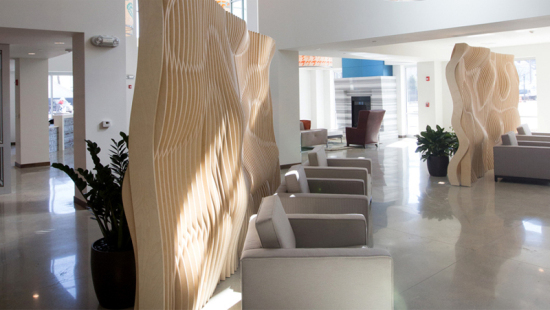 Undulating birch walls create pockets of privacy in an apartment building lobby. 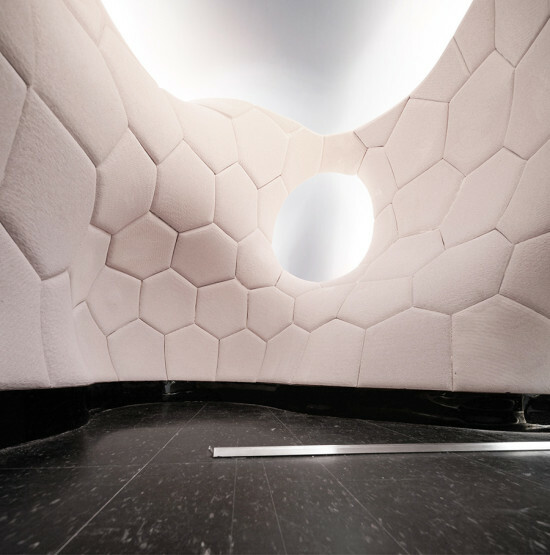 When Boston design and fabrication firm Radlab began work on Clefs Moiré, the permanent installation in the lobby of One North of Boston in Chelsea, Massachusetts, they had relatively little to go on. They knew that the apartment building's developer wanted a pair of walls of a certain size to activate the lobby space, but that was about it. "Normally we get more information, so we can come up with a story—a concept based on the building and its requirement," said Radlab's Matt Trimble. "For this we pulled back and said, we have an opportunity to be a little more abstract about how we approach this conceptually." Inspired by moiré patterning and a harpsichord composition by J.S. Bach, the team designed and built two slatted birch walls whose undulating surfaces embody a dialog between transparency and opacity. The client's interest in achieving moments of privacy within a public space led Radlab to moiré patterning, the phenomenon in which a third pattern emerges when two other semi-transparent patterns are superimposed on one another. Trimble compares the moiré effect to standing in a cornfield. "It's not until that moment when you look at it from the perpendicular that you see the rows of corn," he said. "When you look to either side, the crossing prevents you from seeing depths." The designers decided to think about the two walls as a single volume that would later be split. "There's this potential for reading it as a single wall when you look at it from different perspectives," explained Trimble. "This made sense because the project is about viewpoint. If you're perpendicular to the wall, you see straight through it." Radlab began with a traditional approach to moiré patterning, playing with identical vertical components set askew to one another. Then they looked at J.S. Bach's Partita No. 2 in B-flat Major: Gigue. Bach's challenging composition requires the performer to cross his or her hands, the left hand playing the treble clef while the right hand plays the bass. "That became an inspiration for a way to structure and organize the two walls," said Trimble. "To think of one as being the result of a bass set of wavelengths, and the other as a treble set." The designers realized that they could modulate the metaphorical wavelengths across both the vertical and horizontal sections to create an interesting, and varied, third element. "That's where the Gigue became influential," said Trimble. "It gave us a way to create a rhythm in the wall that would pace itself." The team relied heavily on Rhino and Grasshopper both to design the installation and to plan fabrication. "We would create various iterations in 3D modeling software, then disassemble them into the flat XY plane and try to understand: how would we actually build this?" said Trimble. Simpson Gumpertz & Heger's Paul Kassabian provided crucial help with structural engineering, including designing a base plate that is invisible except when the wall is viewed from a 90-degree angle. Radlab CNC-milled the wood slats and spacers before coating them with varnish. "Fabrication was long and arduous, but it challenged us in really great ways," said Trimble. The group developed a hanging mechanism to efficiently apply fire retardant to the ribs. To prevent varnish from adhering to the points of connection between the ribs and spacers, they fabricated each spacer twice, once out of birch, and once out of chipboard. They affixed the chipboard templates to the ribs before spraying the varnish, leaving an untouched patch for the final spacer. "It was process-intensive, there was no getting around that," recalled Trimble. "But we embraced that process-intensive journey from the onset, to see if there were ways we could be creative about creating improvements to make fabrication more efficient." On site, Radlab laid down templates of the base plates to drill holes for the anchor bolts, then returned with the walls themselves. Each wall was prefabricated of four panels and assembled in the shop. "They tilted up almost like tilt-up concrete walls," said Trimble. In addition to having inspired the form of Clefs Moiré, Bach's Gigue works as a metaphor for how the finished walls perform in space. "It starts and stops abruptly," explained Trimble. "There's no crescendo or tapering of intensity. The walls do the exact same thing: there is no rising up from the ground or falling into it. They start and stop in a similar way." Installation investigates the future of facade design and fabrication. Unlike some student projects, AAC Textile-Block v2.0 was shaped by both practical and speculative concerns. In back-to-back courses at Pratt, undergraduates designed and fabricated a prototype section of a screen wall system made from autoclaved aerated concrete (AAC). Co-taught by Lawrence Blough and Ezra Ardolino, the design studio and prototyping seminar encouraged students to look beyond their computer screens to real-world constraints including block size and light and air circulation. "The idea was that we wanted to make something that has an application later on," said Blough. "It was more than a run-of-the-mill digital fabrication project," added Ardolino. "It was really a comprehensive fabrication project." Each student in the design studio created a scheme for a four-story facade comprising modules cut from standard 8-by-8-by-24-inch AAC bricks donated by Aercon AAC (additional funding was supplied by the Office of the Dean of the School of Architecture). All of the assemblies were required to be self-supporting; some students designed them to be structural or to act as a weather barrier as well. 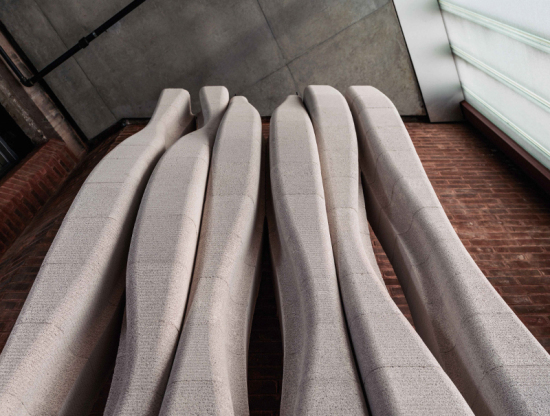 With help from structural engineer Robert Otani and facade consultant Erik Verboon, both of whom teach at Pratt, the students explored their designs using Rhino and wire-cut foam models before CNC-milling prototype wall assemblies from high-density foam. During the following semester, Blough and Ardolino's seminar moved into design-development. Again with Otani's assistance, the class modified one of the designs generated in the studio for fabrication. Among the issues the seminar students addressed was the balance between uniqueness and repetition in the final assembly. "Every block could have been unique, but then there's a question of whether or not it's more efficient to incorporate repetition," said Ardolino. "The students solved that one: they figured out how they could set up the system to be somewhat repetitive." The assembly as built contains 96 blocks of 20 different types. "The earlier stuff I'd done was trying to use as much off-the-shelf material as I could," said Blough. "Here we decided to really push it, and to take on more of the ideas of mass customization." Students milled the AAC modules from 8-by-8-by-12-inch half-bricks using a reconditioned auto-industry robot at Timbur, Ardolino's computer-aided design and fabrication studio. After considering their options, the team settled on an "in the round" strategy, in which the tool makes parallel passes around the Z axis of each block. The blocks were held to the table using custom-milled high-density urethane foam jigs. By working from the largest module to the smallest module, the students required only two jigs. "As the block got smaller, more and more of the jig got eaten away during milling—like a palimpsest," observed Ardolino. While Ardolino managed the off-site fabrication, Blough oversaw assembly in the School of Architecture lobby. Students volunteered their time between classes to lay courses of the milled blocks, using a high performance polyurethane construction adhesive in place of mortar. Slotted steel plates located two courses from the top and bottom of the 10-foot 8-inch by 4-foot prototype accept 1/4-inch rods, which also pass through channels milled into the faces of pairs of blocks. Thinner, staple-like steel rods provide horizontal reinforcement every fourth course. When the installation was up, the assembly team, realizing the floor was uneven, pushed it into plumb before shimming it and re-adjusting the tension on the rods. Though the installation is presently unsealed, Blough and Ardolino are investigating an epoxy-like coating that would protect the blocks from contact damage without obscuring the tool paths. "We like the tool paths—they make it look like dressed stone," said Blough. Though the multi-semester project was designed as a hands-on learning experience for the undergraduates, the professionals involved benefited as well. "I like the idea of this cross-pollination between what goes on in my office and in Ezra's office, and that we can then bring it back to the studio and really push it," said Blough. "It was really liberating for me to take it to this whole other level with Ezra and the students, because you have all these great minds working on it." 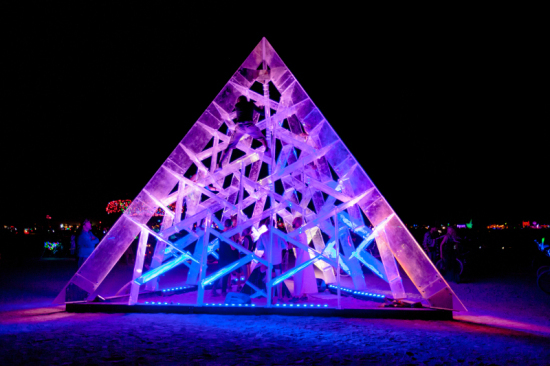 Prismatic pyramid evokes desert mirage by day, Aurora Borealis by night. Given that their pyramidal acrylic installation at this summer's Burning Man was inspired in part by Pink Floyd's Dark Side of the Moon album cover, it seems safe to say that the architects at Red Deer "get" the festival's vibe. "We try to get very intimate with our sites, so it was interesting to approach one that we hadn't been able to visit," said founding director Ciarán O'Brien. "Some of the primal forces we could see at play there were the heat of the desert and the way people interact with structures. Specifically, for us it was about light in all its forms." The UK firm worked closely with the structural engineers at Structure Mode to design a transparent six-meter-tall structure comprising interlocking equilateral triangles, while New York Institute of Technology professor Charles Matz contributed an integrated light display based on the Aurora Borealis. "All kinds of imagery came to mind that held to the desert landscape," said O'Brien. "By day, the concept evoked a mirage; by night, a kaleidoscope. One is ephemeral, a non-place; the other is specific, a beacon." Called Luz 2.0, the Burning Man installation is only the latest iteration of an ongoing exploration of the relationship between matter and light. The project began as a response to a commission for a band pavilion. "Red Deer's original idea was a scaffolding framework that would be clad in some reflective material," recalled Structure Mode's Geoff Morrow. "We suggested going one step beyond that and building an acrylic pyramid, to make it much more special." The clients canceled, but the designers applied for grants, ran a successful Kickstarter campaign, and debuted Luz at Secret Garden Party 2013 in Abbots Ripton, England. 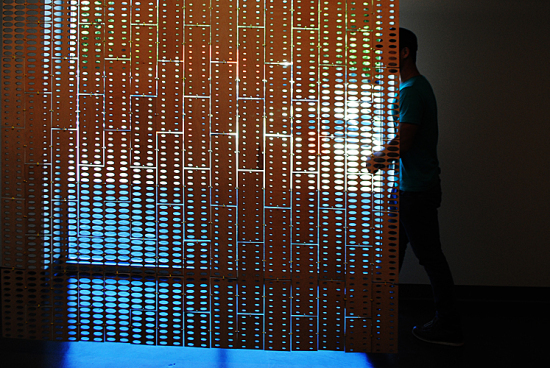 The first Luz featured a touch-sensitive floor screen-printed with a colorful pattern that appeared to change shape under different lighting conditions. For Burning Man, Red Deer omitted the floor "so that you interacted with the playa landscape," said O'Brien. Red Deer and Structure Mode jointly developed Luz 2.0's reciprocal modular system. "It was really interesting investigating how all these different connections could work, what different shapes could work within a three-sided pyramid," said Red Deer's Lucas Che Tizard. "The system we use is composed of equilateral triangles, but it actually gives us more than just pyramids—you see hexagons as well." The architects worked first with hand sketches, then transferred their ideas to SketchUp before moving to 3ds Max, Rhino, and Vectorworks to finalize the structure and start to explore how the modules would connect to one another. Structure Mode analyzed the design's structural stability in Oasys' GSA Suite. Red Deer flattened the final design and emailed the files to the CNC cutters. At that point the three-dimensional installation "became a flat pack kit," said O'Brien. "Part of the challenge was that each of these pieces should be human-sized, so that they could be built by a small team using basic tools in desert conditions." To simplify installation, Structure Mode developed a streamlined bolt-and-nut assembly based on furniture-making connections. "In a way it's kind of low-tech, but it looks high-tech," said O'Brien. The UK contingent shipped Luz 2.0 to the Nevada desert in three crates. The components took longer than expected to arrive: though they had hoped to begin installation on Monday, the architects were forced to wait until Thursday. Nonetheless, the on-site crew managed to assemble the pyramid in just two days using hand drills. Matz's team, meanwhile, arrived on site with the electronics, including custom hardware based on 3D models sent to them by Red Deer. The installation of the lighting system "came together seamlessly," said O'Brien. "We were somewhat concerned about voltage, but it worked out." The only disappointment involved the Mogees sensors, designed to trigger changes in the light show as visitors climbed on and around the pyramid. They worked well in a small-scale test, but "unfortunately the settings didn't translate to the seven-meter structure," said O'Brien. "I can't say it fully fulfilled that brief." Red Deer and their collaborators will soon have another shot at realizing the vision behind Luz 2.0. As befits the installation's emphasis on the immaterial—not to mention the ethos of Burning Man itself—the architects plan to re-erect the structure elsewhere. "We've had quite a few offers from various benefactors, but we haven't figured out what would be best," said O'Brien. "Right now it's in storage in Reno, awaiting its next move."